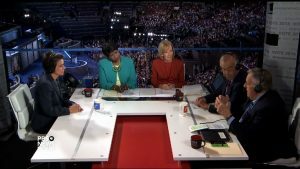 Here is a direct link to a video of a brief but insightful discussion on PBS (on July 27, 2016) chaired by Gwen Ifill, joined by New York Times columnist David Brooks, syndicated columnist Mark Shields, and Amy Walter of The Cook Political Report. They weigh in on how politics in America have changed, as have the rules for both parties. “Hitting the normal Democratic buttons may not be enough,” says Brooks. Shields suggests Clinton is missing an opportunity by not pursuing disaffected Republicans turned off by Donald Trump.